In this game we will see how agents that are exactly the same follow the same instructions and generate a complex collective behavior. Let's play this swarming game! Time required: 10 minutes for preparation, 5 minutes of playing, 2 minutes for conclusions. Special conditions: Players must be in even numbers (10, 12, 14) in a room or space allowing free movement. Children can be divided into two (or more) teams to motivate them to solve the challenge before the others. With a pen, draw a moon at the right hand of each child. 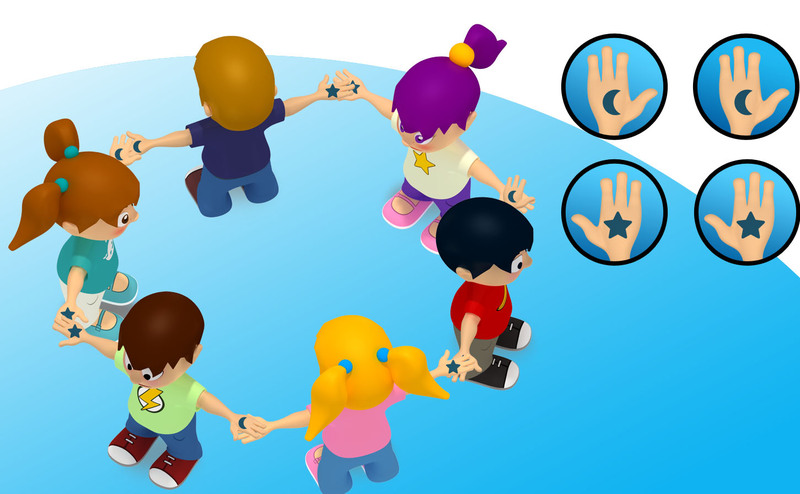 Draw a star on the left hand of each child. Explain the rules to the players. Hold hands. All hands should be holding another hand (no hand can be free). Holding hands must have the same picture (moon with moon, star with star). These two minimal instructions result in the formation of one or more circles of children alternately facing inwards and outwards of the circle. Children might think of the alternative possibility of crossing hands; in this case instructors can add an additional rule: arms should be extended.